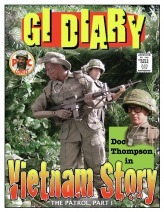 VIETNAM STORY follows the "in country" exploits of Medic "Doc" Thompson during his TOUR OF DUTY. Doc is assigned to an infantry platoon in the 9th Infantry Division. 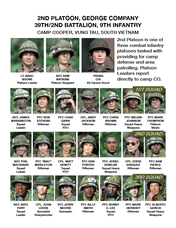 The platoon is stationed at a fictitious base called FIREBASE COOPER in the Delta. 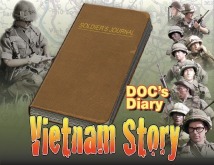 Through Doc's eyes we meet the men of 1st Squad and experience the horror of combat in The NAM. Doc is new to the platoon and he is going out with 1st squad on his very first patrol. He doesn't know what to expect and he wonders whether or not he has what it takes to do his job under fire. It is Doc's second time in the bush and he finds himself caught in a struggle between life and death. The platoon is ambushed and the metal of the men is tested to its limit. Each of my stories start with an idea and coupled to that idea is a lot of background info that I can reference on an ongoing basis to tell a consistent story. In this look behind the scenes you will find information on each of the characters as well as other facts that have been used to help write the series. You will be introduced to some characters that you haven't seen in the story yet, but they are coming. There are a lot of stories that still need to be told in this series. We are just getting started. 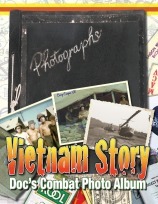 A lot of soldiers have created photo albums or scrapbooks as a visual reminder of their experience and friends. Doc is no exception. You can get a look here at what he has collected so far. You've seen the diary pages in the story. 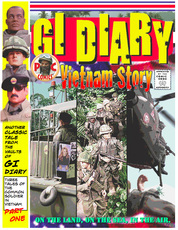 Here is the actual diary as completed up through the beginning of the second episode. 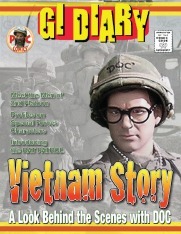 Before the comic above came into being, I created another Vietnam story that was the inspiration for the present comic. 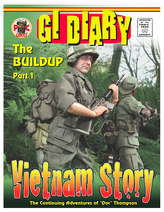 The idea behind this story is that it would follow three newbies through their tours of duty and that in some way the stories would all be interconnected. It was a pretty good idea, but then I moved and left my PBR behind with a Colorado Joe Club member. 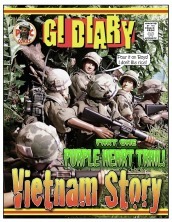 That pretty well ended this version of Vietnam Story, but the first comic survives. Here it is in three parts.